When justice is for sale, every jury has a price In Biloxi, Mississippi, a landmark trial begins. There are hundreds of millions of dollars at stake and soon it swerves mysteriously off course. The jury is behaving strangely, and at least one juror is convinced he's being watched. Soon they have to be sequestered. Then a tip from an anonymous young woman suggests she is able to predict the jurors' increasingly odd behaviour. Is the jury somehow being manipulated, or even controlled? If so, by whom? And, more importantly, why? 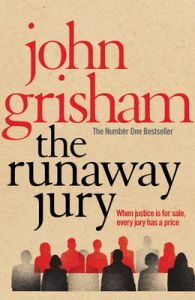 John Grisham is the author of twenty-two novels, one work of non-fiction, a collection of short stories, and a novel for young readers. He is on the Board of Directors of the Innocence Project in New York and is the Chairman of the Board of Directors of the Mississippi Innocence Project at the University of Mississippi School of Law. He lives in Virgina and Mississippi. His website is www.johngrisham.co.uk.